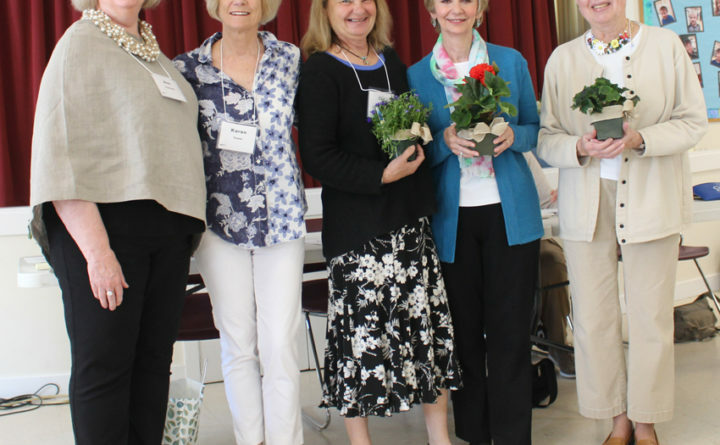 CAMDEN — Outgoing President Ann Vanosdol announced Camden Garden Club’s new officers at the meeting held on May 24 at the First Congregational Church in Camden. Karen Cease will take over as president, Ciel King as vice president, Sandy Hurlbut, recording secretary and Mary Ireland will continue as treasurer. During her two year term, Vanosdol came up with an innovative idea to promote the club by designing dark green aprons with Camden Garden Club embroidered on them to be worn by members at club events such as the plant sale, Village Green clean up days and during the House & Garden Tour. As a token of their appreciation for her leadership the club members presented Ann with a personalized version of the apron with her years of service and the Audrey Hepburn quote “To plant a garden is to believe in tomorrow” printed on it. With the new officers installed, the club is now focused on the 71st annual House & Garden Tour which will take place on Thursday, July 19. All of this year’s properties are located in Camden and all have interesting details and highlights to share with tour goers.